Johann Theodor de Bry. 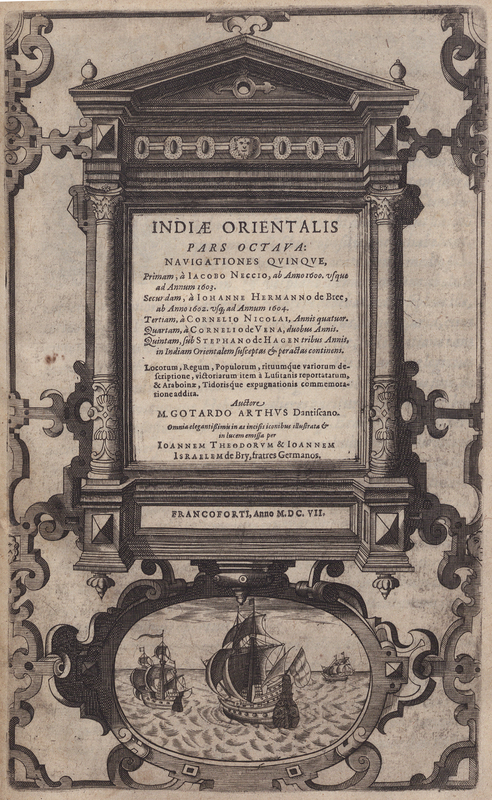 Indiæ Orientalis pars octava: navigationes qvinqve, primam, à Iacobo Neccio ... secundum, à Iohanne Hermanno de Bree ... tertiam, à Cornelio Nicolai ... quartum, à Cornelio de Vena ... quintam, sub Stephano de Hagen ... in Indiam Orientalem susceptas & peractas continens ... Auctore M. Gotardo Arthvs. Francoforti: s.n., 1607. Johann Theodor de Bry was an engraver and publisher born in Strasbourg, France in 1561 and was a son of Theodorus de Bry. He greatly aided his father in his important works such as the Florilegium novum published in Frankfort in 1612 and worked with his brother Johann Israel (1565-1609) to complete the two volumes of Boissard’s Romane Urbis Topographia et Antiquitates left unpublished at his father’s death. In 1598, Johann Theodor took over his family’s printing house and moved the enterprise from Frankfurt to Oppenheim. This text contains Roelof Roelofsz's narrative of a voyage by J.C. van Neck to Ternate and Macao, and the city of Patane; an account by J.H. Bree of a voyage to the East Indies under the command of Admirals de Weert and Pletersz; the relation of a visit to China by Corneille Nicolas; a voyage to China under Cornelis van de Venne, and the voyage of Steven van der Hagen to the Moluccas in 1603-06. 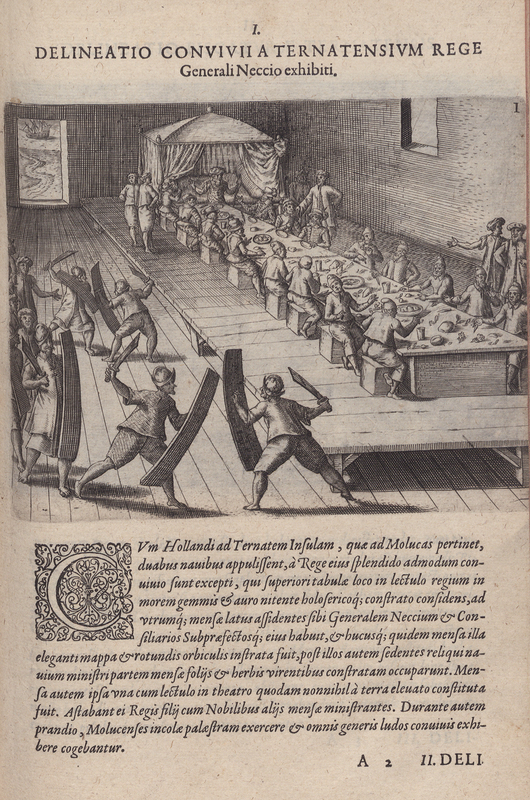 The illustration depicts a feast of a king with the entertainment of sword fighting. 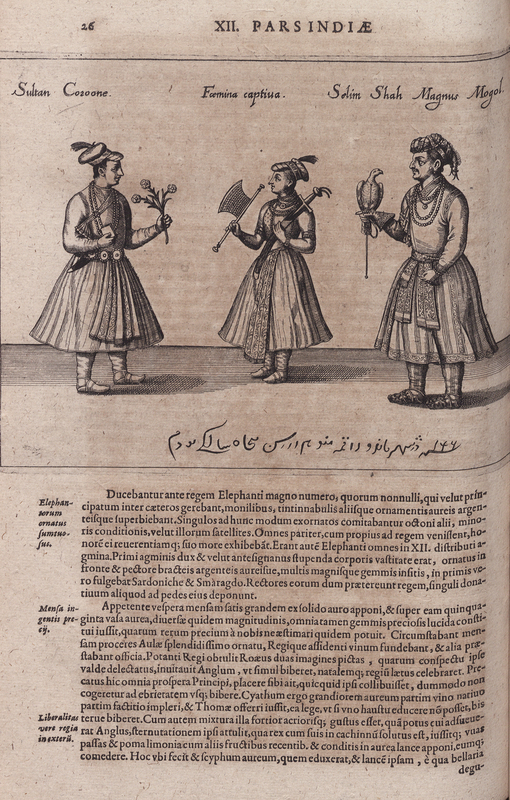 The next illustration represents the members of a Persian palace in their native royal apparel.